We won’t be contained to a Tweet, or reduced to a Snapchat image. We won’t settle for stereotypes or be comfortable with injustice. Instead, 30 of us from 16 different schools in the Kansas City region will come together and build a better community by crafting and sharing our stories. 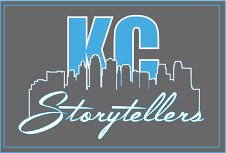 We are the KC Storytellers Scholars. You should hear what we have to say. Read about the KC Storytellers from a feature on Educator Innovators, and read about the other LRNG grants. Students: You need a teacher-advisor who will nominate you. Then you complete an application. We can only accept 40 students city-wide. You’ll work with high school students from different schools, learn about the craft of storytelling, and share your story with our community. Read more here. Teachers: Nominate up to 5 students (though only 2 students per school will be admitted) now through December. The students you nominate should have stories to tell that our community should hear and should be open to experiencing the stories of other students from diverse backgrounds. As a nominating teacher you won’t attend workshops, but you agree to check-in with students during the program. KC Artists: Send us a note through our Contact page if you are interested in working with the Scholars. KC Community: SAVE THE DATE! Saturday, April 29, 7-9pm. Be a part of the Storytellers Exhibition. We want to help take student writing outside of classroom walls. Teachers create opportunities for personal writing and nominate students. Students craft and share their stories with a larger community. The community embraces and amplifies the stories of young people. Teachers can nominate up to 5 students to be KCStoryteller Scholars. We select 40 students from diverse schools to become Scholars. They will learn craft of storytelling, work with professionals, and share their stories. We celebrate the stories from our community on Saturday, April 29, 2017, 7pm -9pm.